Karen Kent Testimonial - Heatmaster Systems Inc. I woke up to no heat with a baby in the house and Rob came right away. He explained what happened, fixed it and told me what to do if it happened in the future. I was really impressed. Highly recommend-thanks! 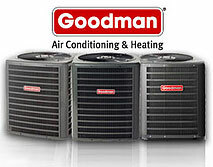 We carry the highest quality Keeprite and Goodman products, however other models can be special ordered. Call us now for a quote! Our 24 hour service is available from October 1st until April 30th. Our technicians are available at all other times throughout the year from 7:30am until 9:00pm 7 days a week.